In 1953, Singer introduced the 222K, the first Featherweight with retractable feed dogs, and the first freearm sewing machine ever. At the time, the company was facing some tough decisions. The first generation of cheap, disposable imports was on the horizon. The company would have to either give up its approach to producing superior sewing machines or it would have to take quality to another level. The 222K, later to become known as the “fabulous freearm”, was Singer’s solution. While the essential features of the 221 Featherweight were preserved, every detail of the progenitor was examined. The wiring system was upgraded. The gearbox was enclosed. The sewing hook was retooled. The throat plate and feed dogs were reconfigured. Engineers figured out a way to retract the feed dogs without having to tip over the machine, like previous Singer models. Remarkably, designers had constructed an entirely new machine of the same size, weight, and overall appearance as the Class 221 Featherweight, but 75% of the base was removable. Sleeves and pant legs could slide under the free arm with ease. Exquisite embroidery could easily be done with this machine. There was no project too delicate or too complex for the 222K. In the end, the Freearm gave way to the imports. Singer produced just 5% as many Class 222 Featherweights as the progenitor Class 221 Featherweight. The last 222K rolled off of the production line at Singer’s Kilbowie plant in Clydebank, Scotland in 1961. 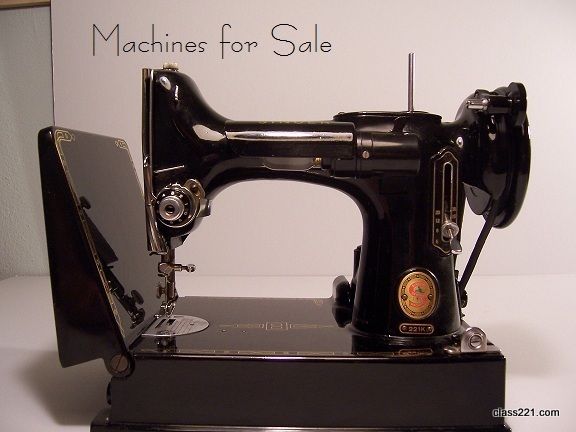 Many afficionados consider this the finest sewing machine ever built.